Please check links below to 5 more Pho Stars! Also visit Pho Variations for more. This is not a competition, it all started with many foodie buddies and I comparing notes about pho on Twitter and formed a very loose Pho group. So I decided it would be a great idea for us to make our pho and share it on our blogs (their links are below.) But we’d crank it up a notch by preparing it with non-traditional ingredients. At least, that’s what I did after making my initial traditional one. It’s open to each person’s interpretation. What we add to it would be our own personal spin, the goal of a “Wok Star!” except this time we are Pho Stars! 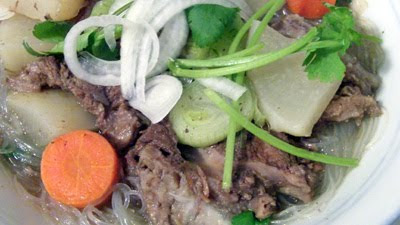 I am so honored to include my Pho Stars and their tantalizing Pho recipes. They put so much time and effort into making and sharing their recipes, they’ve put me to shame with my simple pho and Pho Variations. I wish we could live closer and actually have a Potluck Pho gathering. Thanks for sharing! We hope you will be inspired to make your own pho after reading our blogs! Once you make it, it’s addictive, so watch out. Bonita, a publishing professional in Toronto and food hobbyist made an out-of-this-world, complex Duck Pho. I definitely want to try this version next. If you love duck, this is IT! Boneats, I’ll Show you mine if you show me yours. Don and Jenn, Don’s an IT professional, their blog Foodieprints, Lamb Faux Pho: An experiment in Fusion shows their pho obsession. Our broth share a similar element – it’s not clear. Another favorite meat of mine is lamb, what a wonderful use of it. Robbie Nicolaisen, Private Chef, spice blends, hopefully adopting father of Asian kid. Gosh, another complex duck pho and made from scratch. I can smell it now, I like your choice of veggies! ESEChefs: My Style of Pho. Pho is a Vietnamese broth and pronounced feu, French meaning fire. This post is not about the history or a step-by-step how pho is made because there are numerous and fabulous blogs who do that very well. I’ve mentioned them below so you can check them out. 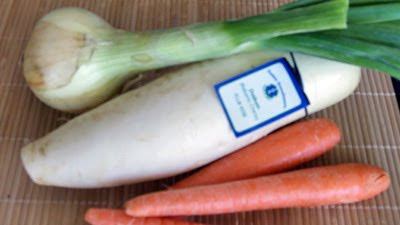 I stuck to very traditional vegetables like daikon but didn’t use fresh bean sprouts to add prior to eating. Having just visited the Redlands and bought some big head onions, I decided to use one and carrots and just top off with cilantro. I really wanted to notice the flavor of the broth and not be distracted by too many other ingredients. When I understand the basis of what a dish consist of, I can then make my variation. So, I’ll be posting Pho Variations to illustrate my point. I’m a big believer in taking the shortest cut to make dinner that’s quick while keeping it simple and tasty. But, when it comes to pho, out goes this belief. The intrinsic flavor of this dish is the broth, so you cannot scrimp on the most important element. At first, I was thinking, am I crazy to spend so much time focusing on just the broth? But once I started, there’s no going back. This is not like making chicken broth which you can easily buy in a carton. I’ve never seen ready made pho in a carton, so if anyone knows of a source, do share. Many of the packaged pho mix has MSG in it and taste processed, so I decided it was worth making it from scratch. 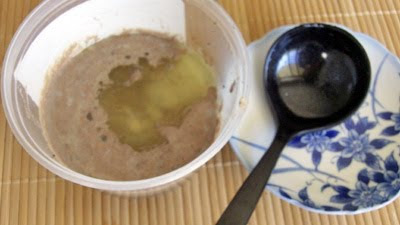 Surfing for the best recipe online is so wonderful because you can compare which one gives the best technique. As an advocate and teacher of a no-recipe technique, I use recipes for inspiration. I just never follow a recipe completely. I pick and choose what I think makes sense and/or have in my fridge. Steamykitchen and Vietworldkitchen (also see below) were TOP of my search for Pho! I’m a huge fan of technique because that’s what I teach when it comes to wok cooking. Once you know the technique of how to do something, you can basically decide how to proceed. Below each photo, you’ll see a very loose “recipe” and method I used to make my pho. I hope this will spark your creativity. I must reiterate I don’t measure anything, so use recipes from the list of Sources below for specific quantities. 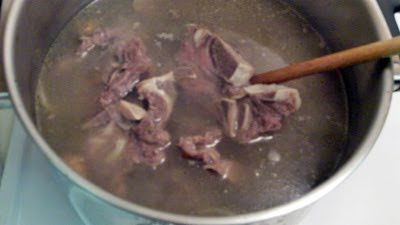 Boiled broth for 2 hours: I used 2 packs of beef neck bones, 1 pack of knuckle in a big pot of cold water. Seasonings: 2 bashed ginger chunks, stick of cinnamon, 5-7 cloves, 4 star anise. Added fish sauce and salt. Skimmed fat and impurities but didn’t throw out first batch of soup. Wiped inside pot clean of impurities with paper towel. I like texture in my soup, so didn’t make mine a clear broth. 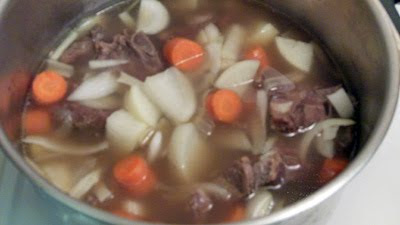 I added in daikon, onions and carrots into broth. 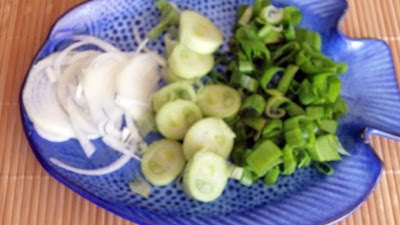 Sprinkled thinly sliced onions and also chopped scallions as garnish. And hey, sometimes my dishes don’t turn out as well but the best part is experimenting and the more I do it, the more I’ll know what flavors and textures I like. Don’t just follow a recipe blindly, use it to fit your own needs. Had this beef neck bone pho with glass noodles. Andrea Nguyen‘s blog: Vietworldkitchen: Basic Pho Cooking Secrets and Techniques If you scroll to the bottom, she lists other pho posts! What an oustanding writer and teacher. I’ve learned so much from her and always enjoy her posts. Her book: Into the Vietnamese Kitchen was a finalist in the James Beard Foundation Award for Excellence, Best Asian cookbook among many other accolades. Jaden Hair‘s comprehensive and gorgeous step-by-step color photos on Steamykitchen for Vietnamese Beef Noodle Pho is how I made my first pho and based on Andrea’s book! Jaden is great with breaking it down and keeping it real plus she knows how to make cooking fun with her witty writing. Anytime I mention Jaden, I must thank her for including Wok Star in her recent Steamy Kitchen Cookbook! She’s on the forefront of the latest media, hang in with her. So many new Wok Stars are born due to her. Loving Pho is the ULTIMATE resource – EVERYTHING you need to know about pho! 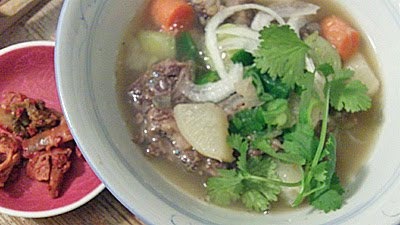 In Pho Variations, I added different ingredients using the same beef broth as base, take a look. Love to hear about your Pho creation and what’s your favorite Pho? Now that I’ve shown you I don’t always cook everything in my wok, here are some dishes I have made in my wok! 15 Responses to To Pho Or Not To Pho?